After controlling Gesias “JZ” Cavalcante for much of the first round, Justin Wilcox found himself on the receiving end of an unintentional eye poke at “Strikeforce: Overeem vs. Werdum.” Unfortunately for both lightweights, the cage-side doctor determined Wilcox’s vision was far too compromised to continue and called the bout just 32 seconds into the 2ndRound. “I was trying to put more pressure [on him] in the second round,” Cavalcante stated. “I came forward and threw the punch. I was expecting him to come in, so I was trying to keep the distance. He came in with his head and got poked in the eye. It appeared as though Wilcox told the physician he couldn’t see when he was being examined, which is typically the fastest way to end things. 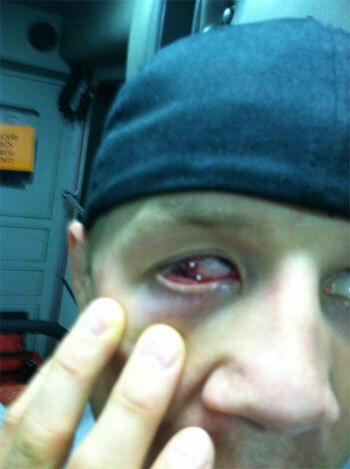 Wilcox was upset he was not allowed to continue, and he wasn’t available for an interview immediately after the bout. Thankfully, his Twitter account was working just fine. “On the way to the hospital, nobody cam stop me with legal move,” Wilcox posted along with the picture above.